This collection includes a full set of Sega CD Games, spanning across 11 DVDs. The games can be played through the "Fusion" emulator on the PC or burned to a CD-R and played directly on the Sega CD Console (no mod chip required). Click the Game List for details. The Mega-CD is an add-on device for the Mega Drive video game console, designed and produced by Sega and released in Europe, Australia, New Zealand, Japan, and North America. 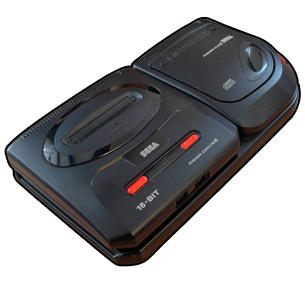 In North America, it was renamed Sega CD, as the name Mega-CD bore no obvious associative meaning in that market where the console was named "Genesis" instead of "Mega Drive". The device adds a CD-ROM drive to the Mega Drive, allowing the user to play CD-based games and providing additional hardware functionality. In addition, the add-on can also play audio CDs and CD+G discs. The development of the Mega-CD was confidential; game developers were not made aware of what exactly they were working on until the add-on was finally revealed at the Tokyo Toy Show in Japan. The Mega-CD was designed to compete with the PC Engine (TurboGrafx-16) in Japan, which had a separate CD-ROM drive. The first version of the Mega-CD sits underneath the Mega Drive console and loads CDs via a motorized tray. A second version places a top-loading CD-ROM drive to the right of the console, and is intended primarily for use with the redesigned Sega Mega Drive 2. Both versions of the Mega-CD are compatible with both versions of the Mega Drive console.